The resort's pool faces out onto the Atlantic. For all the beach bums out there, Long Bay is the perfect Myrtle Beach resort. With a pool, lazy river, and giant checkers, there's a place for year-round activities. Ideal for families, most rentals come with a kitchen and living room. Grab a drink at Ocean View Cafe. Long Bay has its very own sauna. Walk past the windswept dunes and onto a calm, uncrowded beach. The indoor lazy river floats past a water playground, and borders the oceanfront water park with slide and submarine. Younger kids will love playing in the fun indoor water park. The resort is known for its mellow vibe in peaceful North Myrtle Beach. Enjoy a fun swim in the resort's indoor pool. 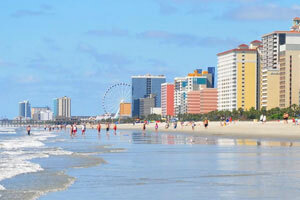 The beachfront Long Bay Resort is located in the heart of Myrtle Beach near the area’s best attractions. After dropping off your luggage in your condo, get changed into swimsuits, grab pool toys and water wings, apply sunscreen and get ready to be amazed. There are indoor pools, outdoor pools, a kiddie pool and a 250-foot lazy river. But wait, there’s more! The submarine water park with three-story waterslide will make the kids so happy that you’ll start to wonder if they are part fish. Relax on the outdoor oceanfront pool deck with a refreshing drink from the tiki bar and work on your sun-kissed look. There are two on-site restaurants if you don’t feel like cooking lunch (you are on vacation after all). Get your cardio on at the fitness center while the kids are occupied with mini golf or in the arcade. Need a mid-afternoon caffeine fix? There’s an on-site Starbucks. Score! Efficiency studio condos sleep four guests. Kitchenettes have a mini fridge and microwave allowing you to make the basics or heat up leftovers. One- to three bedroom condos sleep four to six guests. Get in touch with your inner-Betty Crocker and bake up a batch of your famous chocolate chip cookies in your full kitchen. You shouldn’t have any trouble convincing the little ones to assist – and make sure that the chocolate chip-to-cookie ratio is correct. Catch a sitcom rerun on the Flatscreen TV; it has Cable. DVD players are perfect for a low-key night in for family movie night. Bring favorite movies from home or browse the selection of free DVD rentals available at the resort. Grab the cookies (if there are any left), pop some popcorn and call everyone into the living room. Take advantage of the coin-operated laundry facilities at the resort so that all you have to do when you get home is unpack. Good news! All condos are air conditioned, allowing you a break from the South Carolina heat. Ripley’s Aquarium features a 750,000-gallon shark tank, glass-bottomed boat rides and stingray experiences. Ripley’s Odditorium has the personal collection of strange and unusual artifacts that belonged to the creator of the Believe It or Not Cartoons, Robert Ripley. See an authentic shrunken head or check how you measure up to the world’s tallest man. Get ready to shop ’til you drop at Broadway at the Beach. Surprise the kids with a visit to Build-a-Bear and treat yourself to a new pair of shades at one of three Sunglass Hut locations. Bring home a souvenir for your four-legged family member from Reigning Cats & Dogs. Hungry? Joe’s Crab Shack, Hard Rock Cafe and Extreme Pizza are just a few of your dining options. Go for a ride on the Myrtle Beach SkyWheel. It’s almost two-hundred feet tall and provides the best views in Myrtle Beach. Everyone in the family can ride in comfort thanks to the climate-controlled gondolas. Little ones will have a blast exploring the interactive exhibits at the Children’s Museum of South Carolina. They can be a bank teller at The Big Bank, a paleontologist at South Carolina Fossil House or a Weatherperson at the Weather Center. They will have so much fun that they won’t even realize they are learning.